On the outside looking in Amagi Brilliant Park looks like an anime that is geared towards children. And you know what you might be right about that. Does that mean you won't enjoy this anime? That's up to you. In an anime where are talking mascots, fairies, and talking dragons it's hard for anyone who's not in elementary school to enjoy this anime wholeheartedly. 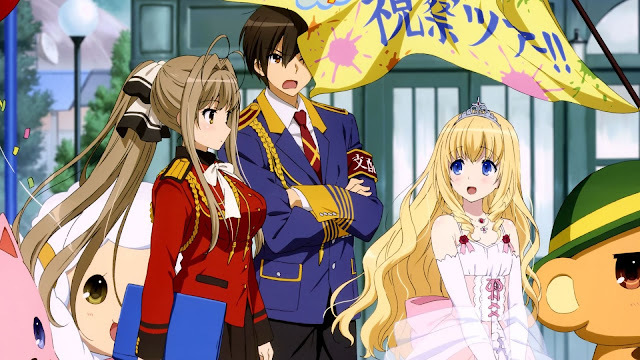 Amagi Brilliant Park follows a high school student by the name of Seiya Kanie where he becomes the "chosen one" to revamp an ailing amusement park known as Amagi Brilliant Park. Seiya meets with the manager of the park, Latifah Fullanza, to discuss the state of the park. After learning that if the park does not reach a certain amount of visitors within a timeframe, Amagi Brilliant Park will cease to exist along with Latifah Fullanza as well. So Seiya is then appointed to manager replacing Latifah, and the anime follows Seiya with the other crew members of the park to save the deteriorating amusement park and ultimately saving Latifah. The art is an area where Amagi Brilliant Park excels in. With it's use of vibrant colours, and well animated characters it's difficult trying to find anything wrong about the art and animation without getting too nit-picky in attemps to finding any flaws within the art. The art itself was a good reason for me to continue on with the anime, even though I felt as if the anime wasn't geared towards someone other than the younger generation, it was very well done in my opinion. In contrast to the art, the sound in this anime was not something I took note of when watching. I hardly even noticed the OST playing at times since none of the tracks really grabbed my attention when watching the episodes. I had to look up the OST and listen to the tracks to familiarize that some of these tracks did play during a couple of the scenes. If anyone has took the time to listen to the OST, did a couple of the tracks remind me of the OST from Zero no Tsukaima; like the track Solitude? Overall the sound was not one to note down in my anime files of memorable OSTs. Going over the characters, I am just going to briefly go over the main characters: Seiya Kanie, Latifah Fullanza, Isuzu Sento and Moffle. Seiya Kanie is your typical high school student who gets appointed to take over management of Amagi Brilliant Park. There's not much to say about him other than he's a very put together person and is good at taking charge and command at things and executing them very well. Isuzu Sento is Seiya's classmate and is the one who recruits Seiya to inform him that he will be taking over command of the park. She has very little to no personality, over the course of the anime we do see her nonexistant personality crack; if you piss her off don't be alarmed if she takes a rifle out and shoots you. Now Latifah Fullanza was the former ring leader of Amagi Brilliant Park, from what I can tell she has no talents in running an organization (hence that's why her park is failing) and thus appoints Seiya to take over. She is stricken with some sort of illness that is described in the anime, and as said earlier if the park doesn't receive a certain amount of visitors she and the park will be nonexistent. And finally we have Moffle, who is a magical talking teddybear-mascot who doubles up as Latifah's uncle (Latifah who seems to be a human with magical powers). Yes, a teddybear is a human's uncle. Let that sink in. I'm not going any further into his personality other that he's very envious of Seiya at the start of the anime but his feelings change towards the end. Overall, I oddly enough somewhat enjoyed this anime. Honestly can't pinpoint why I enjoyed this anime and what kept me going because I felt the anime was so childish. I kind of watched this anime without doing any research about it. If you told me the synopsis of Amagi Brilliant Park prior to me watching it, I would most likely pass since the thought of talking stuffed animals does not appeal to me. You have to be the judge of Amagi in terms of if you would enjoy this anime or not! I'd suggest watching the first episode if you want to give this anime a try because you would get a nice sense of the anime overall from just watching the first episode. Would I recommend this anime to other people? To be quite honest, I don't know. I would say there are better options than this, but I'm not saying don't watch it at the same time since I liked watching this haha. Anyways thanks for reading my review, if you made it this far. As always please comment in the comment section below to tell me your thoughts. And thanks for reading!